In my line of work some things develop quickly ( making contacts for example or finding research material ) and some take time ( product testing and forming long-lasting relationships with people who work in a variety of industries that I am interested to cover on a Curious Russian in London ). The longer I do what I do however, the more accurate my antenna becomes in terms of the people I write about – it’s one thing what the person says to you when he or she wants to make an impression on you, it is quite another when you have a direct conversation. Three weeks ago I received an e-mail from a woman with a beautifully exotic name Axelle Bonaparte and within a couple of days I was sitting in a comfortable armchair in her Hale clinic room, waiting to experience Metamorphic technique and Tsuboki face massage that Axelle practises. There are many treatments and therapies but not all of them are effective plus with each one of us, we need and respond to different things. I hope you will agree with me that trying something new and keeping an open mind is always a good way forward. So is sticking with people whose skills you trust (a great hairdresser who knows you & your hair and won’t make you look like a loop-sided bunny; a facialist who will make your skin look better with the right techniques & product recommendations; or a massage therapist that will help your body feel well aligned and less stressed/ less achy – I can go on but am sure you get the idea what I am talking about). Let me start with explaining the techniques that Axelle practises first. 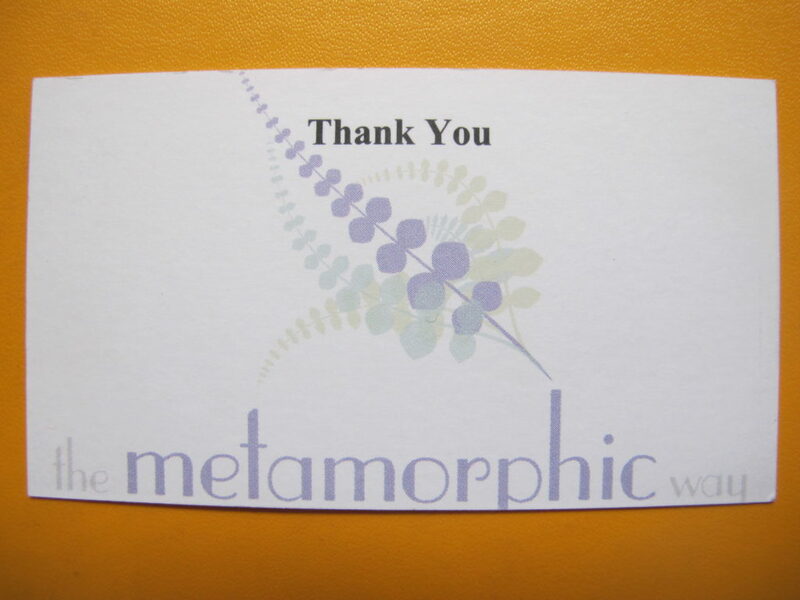 Metamorphic Technique was originated in Britain by a reflexologist Robert St. John who noticed that when people were coming to see him they more or less came up with the similar pattern of problems or issues that concerned them. MT allows for transformation & self-healing to happen from within your body with the hand guidance by a trained therapist. Through stroking & light tapping on the spinal reflex points on the feet, hands and head certain patterns and energetic blocks can be gently loosened up. ‘Following the principle of Correspondence, those specific points represent in Metamorphic Technique the time spent in the womb, when you mother was expecting you. As our cells (DNA) hold the memory of emotions attached to our experiences, we end up ‘carrying’ heavy bags which don’t always belong to us but they can be released once they’ve served their purpose.’ Axelle remains professional and somewhat detached thus allowing for you to experience a free flow of energy through your own and your body’s goodwill. It has to be said that to go and have a session of Metamprphic Technique requires a certain mind-set. For example if you have a substance problem, unless you decided that you need none can force you to deal with your problem effectively- as they say when there is a will, there is way. I run on stress and balance a lot of things on a daily basis, so while I wasn’t looking for a solution to a specific problem I was curious about Axelle. When we meet the kindness that radiates from her instantly endeared her to me and our initial conversation flowed easily. She is tall and a little serious looking due to wearing a black, austere pair of glasses but glasses can’t hide the eyes that dance with joys mischief and humility. Axelle was born in the Pyrenees and travelled a lot during her childhood as her father was in the military. Growing up she loved nothing more than climbing trees and enjoying the sense of freedom that we all take for granted in childhood. Axelle believes that each one of us is unique and so is our purpose in life. I am a little taken aback when in the course of our chat she says that ”the Universe/Highest consciousness/God ‘thinks’ we are a good idea and then creates us and our parents are like a bus we took to get into the material world” but it makes for an interesting subject of reflection as you lie on the massage table & the treatment continues. Axelle mentions to me several times the importance of detachment in what she does and the absence of ego, which fascinates me because I have seen many very talented practitioners be led wayward by their egos that gets stroked by praise from clients and press. Metamorphic Technique is not about change per se, it is more to do with a transformation from cocoon to a butterfly. We live in a grown-up world with many restrictions which makes us behave in a certain way and I think this technique will appeal to those of us that want to grow and expand, without expecting this to be done by someone. Axelle is quite spiritual, so she focussed on studying philosophy and maths for her A levels but later on, when she worked in marketing and did some charity work, the issue that presented itself before her was the sense of not being fulfilled. So out of frustration came a change of direction, when Axelle decided to train in the Metamorphic Technique. Training itself was mentally and physically testing but it allows every potential practitioner to truly learn about himself or herself. Things in our life often shift when we feel ready and our body assists us in the process of cleaning emotional residues. Before I lie down on the couch for the treatment I ask Axelle whether I need to take my socks off and almost giggle nervously when a reply of ‘would you emit less energy if you do ?’ comes off Axelle’s lips. Our bodies are strong and resilient but it helps sometimes to switch the engine off in order for us to be able to re-connect with ourselves, allowing our body to heal. Before she starts the treatment and straight after Axelle washes her hands with cold water, a ritual, that helps to make the energy neutral between the clients. It is actually a great tip to take away for moments of stress, panic or when you feel that you need to calm down – put your wrists under cold running water and keep them in for a few minutes. As I close my eyes and relax fully clothed on a massage table, my mind busy with thoughts, Axelle starts very gently to tap and circle, pressing her fingers on my foot’s big thumb ( she works first on one leg, then switches to another; she applies the same approach when working on your writs and hands ). Interestingly, when she finished working with my first leg, the whole side of my body felt somewhat elongated. Slowly but surely my mind started to calm down, even before Axelle finishes working on my feet and moves on to my writs. The same technique of stroking, circling, pressing on certain points the meaning of which Axelle understands and I have no clue about. The touch feels feather-light, gentle, a fractionate move that calms you. Before I know it I am feeling a little sleepy, as Axelle moves on to work on my shoulders, back of my head and the sides of my neck ( shoulder and neck work is related to Tsuboki about which you can read below; my session was a combination of two treatments, one for body & mind, another for the face; strictly speaking MT focusses on the back & sides of the head ) where I tend to hold most of the tension due to daily work on my laptop. Another technique that I get to experience that day is a Japanese facial massage called Tsuboki, a combination of ‘Tsubo’, an acupressure point and ‘Ki’, meaning energy in Japanese. The technique itself works on different levels but if I generalise the main benefit of Tsuboki is that it helps to improve skin & muscle tone. – the bladder is about purification on the physical level and being too shy or restless. It starts with a neck and shoulder massage which focusses on removing tension 0 looking at one face you can see whether the person is relaxed or tense by just gazing at the jaw lien for example. Tsuboki will also increase circulation to the face thus assisting cell repair, flushing of the toxins and supplying facial tissues with nutrients and oxygen. Axelle cleanses the face with a wipe and then proceeds to massage the face using the fragrance-free and quickly absorbed Fushi Organic Camellia oil, which is full of Vitamins ( A, B, C and E ), as well as Polyphenol which is known for its antioxidant qualities. This oil is traditionally used in Japan where attention and thought are paid to things that will help to relaxing and tone the muscles. What follows is a combination of finger pressure, tapping and stroking which renders me so relaxed that if you snapped your fingers before my face I probably would be too chilled to blink. Axelles fingers seem to be dancing on the face, exercising the ancient art of calligraphy. The overall sensation is both calming and soothing and is unlike any other facial massage I have experienced. When Axelle is finished she walks to the sink to wash her hands, while I feel the sense of solid and comforting calm. Did I expect Axelle tell me any insights after my treatment ? Of course I did but instead she just calmly gives me advice for the days ahead. She taught me a Tree Exercise before she started the session ( put your feet together, stand firm on the ground and close your eyes. How do you feel? I felt like a tree in the wind which was surprising and disconcerting but as I focussed and tried to meditate, my centre came back in balance – take note, it is a great grounding and calming exercise you can do anywhere ). I was told that my hands are busy ( it made sense as some time passed and I gave it some thought ) and that I need to nurture myself ( made perfect sense but often I choose to ignore it, forgetting that a balanced person is a happier, more productive person which reflects on our universe ). Axelle asked me not to drink coffee,tea or alcohol for a few days. She also told me to drink lots of water that evening and for a few days after that, to allow the body to shift all the things it deemed necessary. Generally Axelle recommends not to drive after the treatment, so as I was her last patient that day, she firmly insisted to walk me to my car, even though I tried to object and say that I was fully capable of doing it myself. How do I feel now, a couple of weeks after the session? I woke up the next day feeling relaxed but a bit achy everywhere, with the aches disappearing of its own accord ( as well as flushed with the water that I have been drinking copiously ) the following day. At times I am calmer & more grounded and all of a sudden I started doing things that I love but long neglected due to my schedule. I crave the sense of calm and not doing anything. I drink more water, I pace myself a little better and somehow I feel good about the choices that I am making. I now bite my tongue before offering my opinion and advice, asking myself whether is it truly required or if I will simply waste my energy which won’t be appreciated or reciprocated. Axelle has kindly checked on my via e-mail a few times and while she won’t reveal much about what she focussed on during the session her advice is intuitive, wise and it makes sense to me. There is no second guessing here, just making a conscious decision to be true to yourself and making sure that you look after yourself. As Axelle herself says ‘balance is a fine line and a continuos awareness to keep’.